Eastern Bank Job Circular 2019. 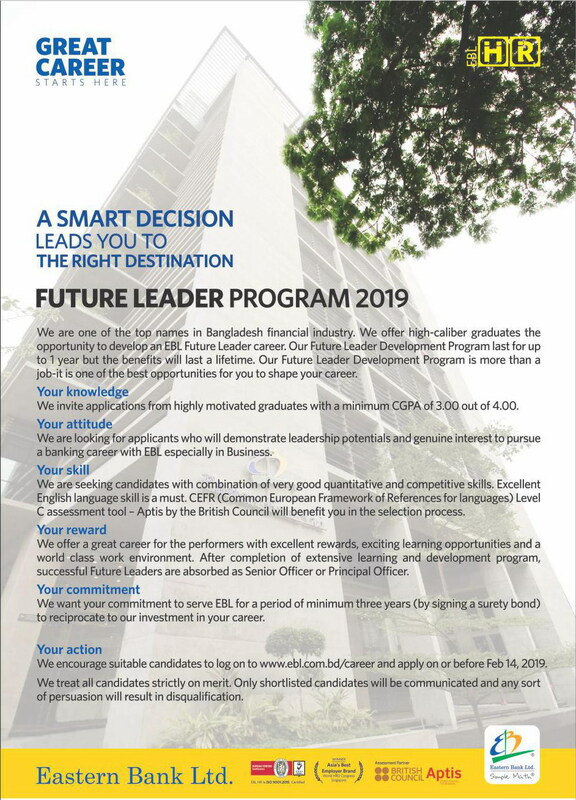 EBL Future Leader program 2019. Eastern Bank Ltd Management Trainee Circular 2019. EBL Trainee Assistant Officer Circular 2019. Eastern Bank Limited Career. EBL job application last date February 14, 2019. Interested applicants are requested to apply online by EBL web site www.ebl.com.bd/career. If you are looking specialist banking career, then you are invited for apply. This company started it’s operation from 1992. It is consumer & SME sector has strong base. They require talented and self motivated young personnel for future leaders. Eastern Bank Limited is following equal opportunity for all employees. So, selected applicants will get additional facilities based on their merits. Applicants will get confirmation as senior officer after six month. Completion of probationary period, they will be promoted as permanent employee. Finally selected candidates have to sign for 3 years security bond in favor of Eastern Bank.